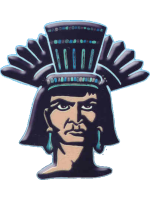 National City,1962. 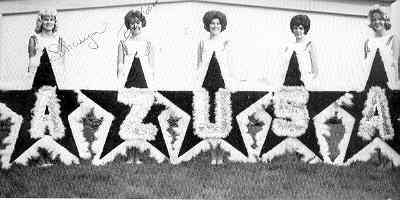 L to R, Sharon Shultz, Barbara Holmgren, Helen Cauthen, Shirley Chance and Donna Prishmount. After high school, I went on to major in music in college. I went to Cal Stae L.A. I decised to join the Fire Department before being drafted during the Viet Nam war and unpon returning from the Army decided to remain a firemen instead of making music my career. I remained a fireman for 35 yrs. and upon retirement started playing the drums again. I am currently playing in 2 different 15 piece “Big Band” Jazz groups. I remember Freshman yr. Sophomore yr. Junior yr. Senior yr. The best memories were the ones I had while in the Marching Band. We won 3 Sweepstakes trophies in a row at National City. We were invited to play at the winter olympics in Squau Valley as well as the Presidential Innauration parade in Washington, D.C. for President Kennedy. Unfortunatly back in the 60’s the school board would not let us attend either. We performed for the Pro Bowl in the Los Angeles Colliseum among other things. It was a magical time. I was the Band President and will never forget my time while in band. It doesn’t seem possible but I will turn 60 my next birthday. 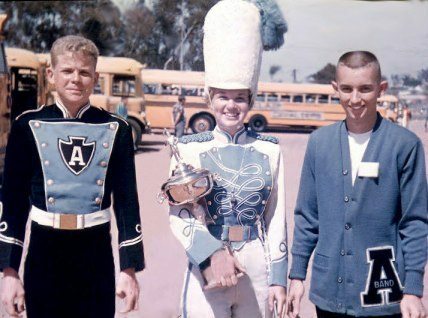 Hello to all the Azusa High Band members no matter what years you were in the band. Carry on the great traditon of the past as well as the future. OOPPS !!!!! Correction !!! 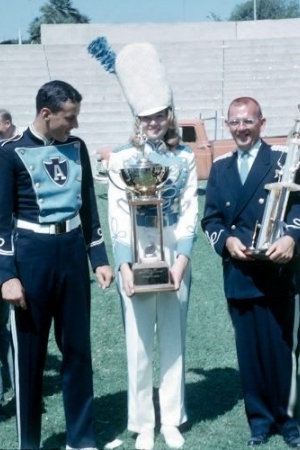 Please note that Jack Frye was the Drum Major my Freshman -Junior Year, not Darlene Kemper. 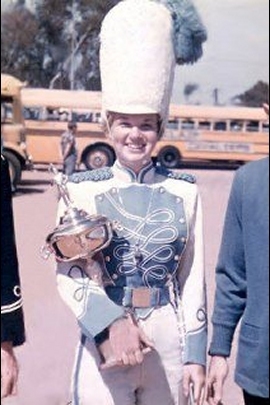 Darlene Kemper was Drum Major my last (Senior) year only. Sorry for the mistake. By the way, Jack Frye ended up being on the same Fire Dept. as my self retiring as a Battalion Chief. Also I forgot to mention that I met my wife while in the band at Azusa (Charrie Williams) and we have been married mow for 36 yrs. Thanks again for this wonderful web page.